This webinar will explore how embracing a data centric approach when designing solutions can help VSPs generate new revenue streams and unlock the hidden value of data. Hyperconverged“ Infrastrukturen (HCI) kommen in Rechen-zentren, im Mittelstand sowie in Zweigstellen immer häufiger zum Einsatz. Damit können Unternehmen sehr einfach und schnell virtuelle Umgebungen implementieren und erweitern um neue oder wachsende Workloads zu unterstützen. HCI-Systeme bieten darüber hinaus genau vorhersehbare Betriebskosten. Wir möchten Sie am Dienstag, den 29. Januar 2019 um 10 Uhr einladen, an unserem HCI Webinar teilzunehmen. Erfahren Sie im Rahmen der ca. 45 minütigen Präsentation wie eine „Hyperconverged“ Infrastruktur Ihrem Unternehmen helfen kann, IT-Abläufe zu vereinfachen. Please join us for an in-depth conversation on how the blend of your IP, our Dell EMC hardware powered by Intel®, and VMware software means your solutions have better scalability, availability, security, efficiency and simplified lifecycle management. VMware on Dell EMC OEM appliances allows your solution to run multiple operating systems on one physical machine. It adds fault and security isolation at the hardware level, and makes it easy to move and copy virtual machines. It also simplifies lifecycle management as there is an easier transition between hardware generation changes. Additionally, VMware helps your solution to become cloud ready and relevant when your customer is looking for a hosted or cloud solution. •Trends in the industry impacting OEMs today and what’s driving the need for virtualized appliances. 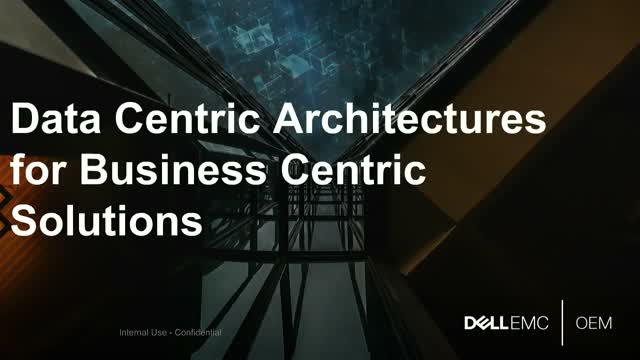 •Hear directly from Dell EMC OEM’s CTO and VMware’s embedded architects on how the inherent benefits of virtualization can help both the OEM’s solutions and their customers. •How solution builders can leverage Dell EMC OEM for a turn-key combined solution that includes support and distribution globally. We hope you’ll be able to join us for this informative and valuable session. Im Rahmen der ca. 45 minütigen Präsentation, möchten wir aufzeigen, wie ein Ansatz, bei dem Ihre Daten im Zentrum der Entscheidung stehen, bei der Entwicklung von vertikalen Lösungen dazu beitragen kann, neue Einnahmequellen zu generieren und den oft verborgenen Wert von Daten zu erschließen. The video surveillance market continues to see robust growth, as new use cases and video surveillance vertical applications are emerging, creating a tremendous opportunity for Video Surveillance solution providers to deliver greater value for their customers. From integrating surveillance data in building management systems to save on energy costs to crowd monitoring in retail to offer a better shopping experience, CCTV has lost its closed nature and is progressively integrated with other systems to generate collective business intelligence. To store, manage, protect and analyze increasing volumes of CCTV data while having the ability to integrate with other applications requires to go beyond traditional storage architecture and adopt an open platform that can scale to support future growth. This webinar will explore the benefits of adopting a data lake architecture for building surveillance solutions. Join us to learn how Dell EMC Isilon scale-out NAS Powered by Intel® Xeon® processors can help you build the right architecture to minimize risks while planning for future growth and new applications deployment. 33% of industry leaders will be disrupted by digitally enabled competitors. What does this mean for your business? Join Dell IoT for a quick, 10 minute overview on the impact of the industrial internet of things (IIoT) on manufacturing, and how connecting your machines can significantly improve machine efficiency. Cloud adoption continues to grow with an increasing number of customers choosing this operating model for their data, virtual machines and applications. The traditional appliance must evolve to provide a more cloud like experience for your customers who are experiencing a digital transformation. Technology is transforming the edge of the grid to enable the digital utility of the future. In this quick, 15 minute overview, learn how the team at Dell IoT is thinking about the industrial IoT in the energy sector. Rugged, ready and right along with you. Built from the ground up for harsh environments, the rackable compact size and certifications in shock, vibe, dust, humidity, EMI and maritime mean the XR2 is agile. The de-branding and customization capabilities mean it’s versatile. So whoever you are and wherever you go, you can take rugged with you. Join us to learn how the Dell EMC OEM XR2 server powered by Intel Xeon SP processors gives you anytime, anywhere access to the data and insights you depend on to make work happen. From industrial automation and telecom to healthcare and digital security, this channel is dedicated on helping Vertical Service providers better understand digital transformation's benefits and challenges, and turn innovative ideas into market-ready solutions.